Kylie Jenner and beau Travis Scott‘s daughter turned 1 on Friday and her parents and other family members posted sweet tributes to her on Instagram. Kylie shared a never-before-seen video of her and Travis with Stormi when she was a small baby. “Happy Birthday Stormi ♥️ We Love you..” Kylie wrote. She also shared a slideshow of photos and videos of the child, which includes a clip of Stormi removing a pair of her mother’s shoes from a giant rack inside her walk-in closet, a photo of Stormi sleeping in her car seat as Travis naps next to her, and a pic of Stormi smiling on a yacht. 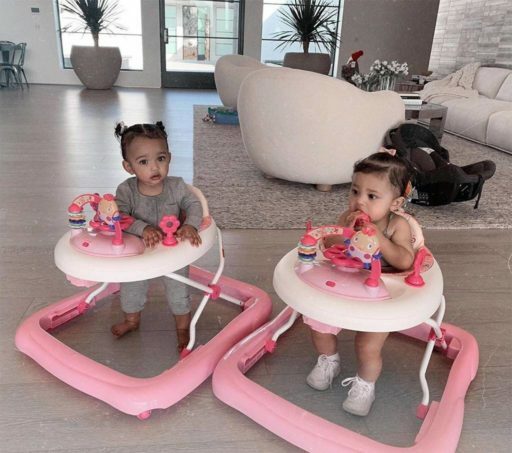 Kylie’s sister Kim Kardashian posted on her Instagram page a photo of Stormi and her and husband Kanye West‘s daughter and third child Chicago West, who is two weeks younger, standing in matching Bright Starts Pretty in Pink Walk-A-Bout baby walkers. Sister Kendall Jenner shared a photo of her holding and kissing Stormi. Mom Kris Jennerposted a photo of Kylie with Stormi. Kylie’s BFF Jordyn Woods also paid tribute to Stormi, posting her own slideshow of images of her with the child.